Dr. Floyd Zulli presents his lecture on the set of Sunrise Semester. 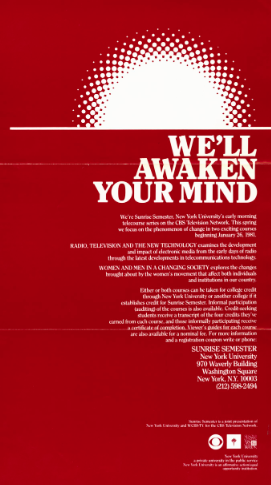 An ad for 1981 Spring Semester courses entices students to take advantage of two new course offerings. 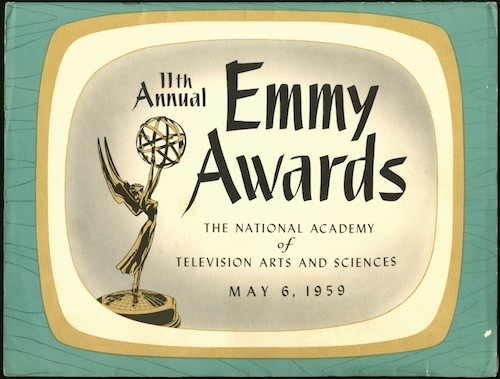 The 1959 Emmy Awards program lists Sunrise Semester as a nominee. 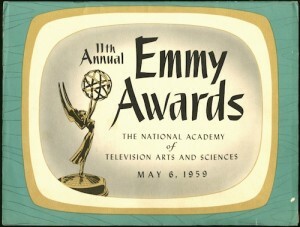 The program would go on to win “Best Documentary or Educational Program” in the New York Area Awards section. With today’s technological advances, it is easy to find low-cost or free reputable distance learning options by simply searching the Internet. New York University’s Sunrise Semester was one of the driving forces in the development of distance learning. The program offered high quality educational lectures via television. 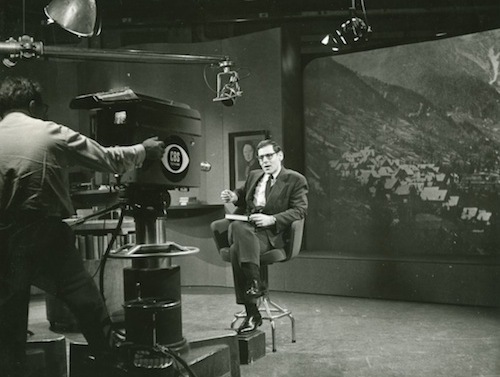 The broadcast was a collaborative effort between New York University and WCBS-TV that began in 1957. Every weekday morning, thousands of people differing in age and profession got up early to attend classes in the comfort of their own homes. Some watched for fun, while others paid for the courses and received credit from New York University for successfully completing courses (this credit was eventually accepted at other institutions as well). Casual viewers who did not register for class outnumbered those actually enrolled in the courses, though significant numbers of students did register. In 1971 the program introduced a credit option for high school students who could put the credits towards their degrees if they attended New York University for college. Audience feedback poured in from all over North America, from New York City to Colorado, Hawaii, and even Canada. One local viewer praised the program, writing, “I don’t usually write fan letters. But if you’ve got a fan club, I’ve just joined it.” College courses as a morning television program were a hit with audiences far and wide with an estimated audience of 2 million at the show’s peak. Sunrise Semester was so well known that the Canadian comedy sketch program Second City Television lampooned it on their program multiple times, and the program received multiple New York Area Emmy Awards. Teaching a class on television differed greatly from teaching to a class. Professors had to be trained to present themselves so that the students watching from their sofas near and far felt connected and included in the lesson. An undated instruction manual for professors reminds them to act in front of the camera and instructs them “not [to] develop the habit of monitor watching.” The guide further prompted professors to “maintain your own individuality and personality.” While it was natural for the educators to speak in a classroom setting, initially it was awkward for them to speak to cameras instead of directly to students. Opportunities for students to meet their instructors did exist. In the earlier years of the program, registered students who made it through the end of the semester were invited to a gala or dinner to meet their professors in person. While Sunrise Semester ended in 1982, it can be considered one of the first leading forces in distance education. The idea of distance learning was abstract from traditional classroom methods. Today, the University Archives houses several recordings of courses from Sunrise Semester. We also house documentation on course offerings, as well as records that reflect the development and administration of the popular morning program. Sunrise Semester represents an important educational innovation and gave traditional students as well as a broader community opportunities to expand their educational experience in a new way. This post comes from Shannon McDonald, a graduate assistant in the New York University Archives.